After fussing and carrying on and spending and age hunched over various stitch dictionaries I have decided that there are two versions of Palestrina stitch. One is worked vertically producing a neat knotted line and the second is worked horizontally producing a knotted line. Each knot has an ‘arm’ that can be varied in length to add variety and interest to the stitch. Both versions produce an interesting textured line that will hold a curve well and both versions look quite complex but once you are in the swing of it are enjoyable and fun. You are not restricted to even-weave fabrics as it is easily worked on many types of fabric forming a characteristic attractive knotted line. 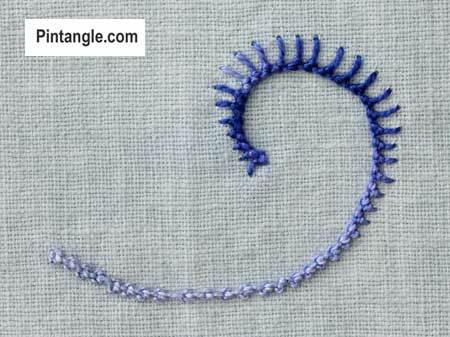 Palestrina stitch can be used as a linear stitch or to outline shapes in a design. 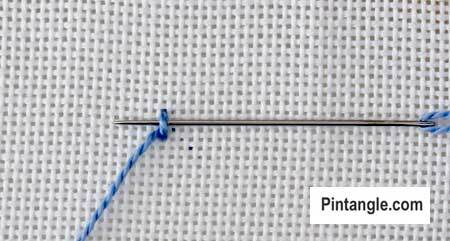 A firm twisted thread, such as pearl cotton, show the knots to their best advantage.The thickness of your thread will change the look of this stitch. I really like Palestrina stitch because it forms a ridge of knots. In this sample Palestrina is worked in Ecru perle #3 thread and forms a line of knots. Start by making a short straight vertical stitch. 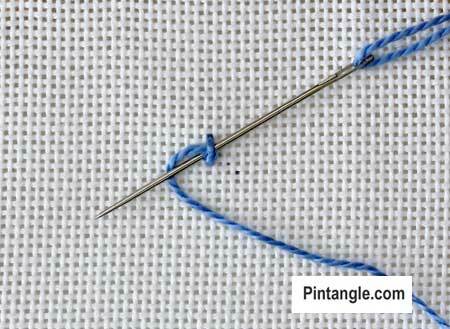 Bring your needle from the back slightly to the left of the stitch and pull the thread through. 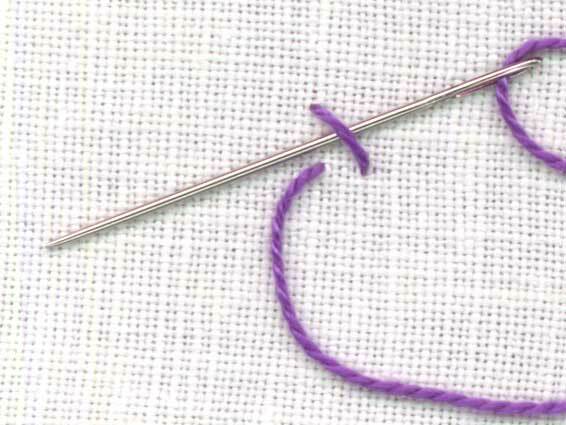 Slide your needle under the straight stitch from right to left. Do not pick up any of the fabric at this point. 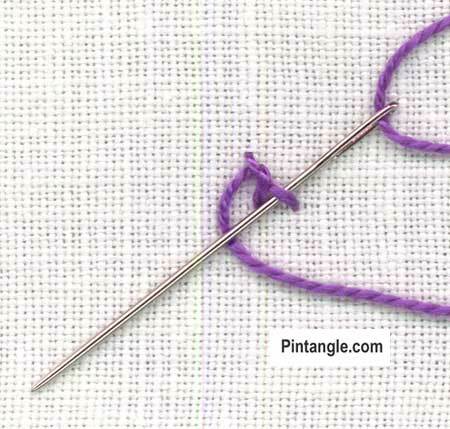 Pull the thread through so that a loop forms around the straight stitch. You are wrapping the stitch with the thread. Pull the wrap snug but not too tight. 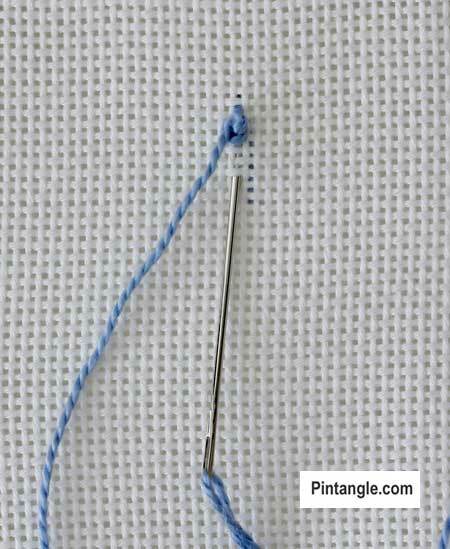 Slide your needle from right to left diagonally under the straight stitch. 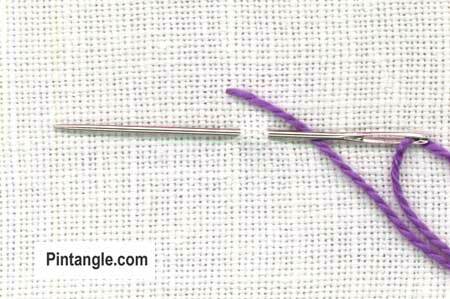 Keep your needle above the loop and again, don’t pick up any of the fabric. With your thread under the needle pull the needle through to form a snug knot. 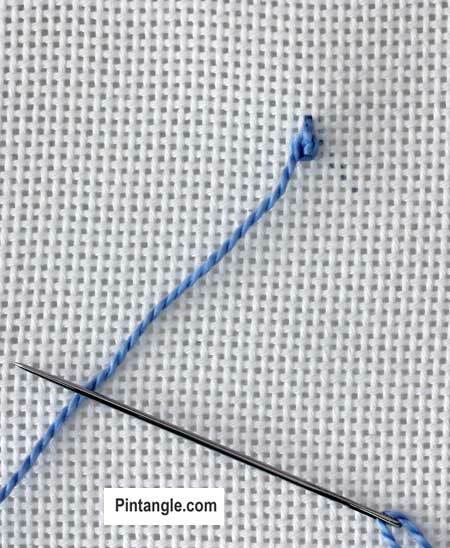 Bring the needle out on the left side of the stitch and repeat each knot down the line. Work the stitch from left to right, along a line. 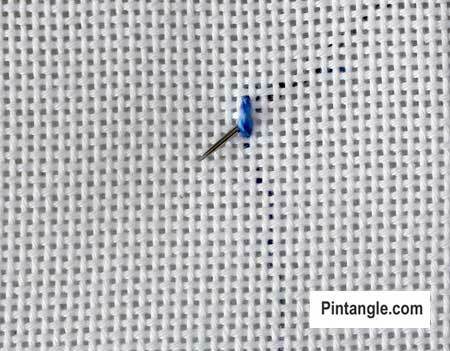 Bring the needle up through the fabric and make a small stitch diagonal stitch before taking the needle to the back of the fabric. This forms the first bar on to which the stitch is made. 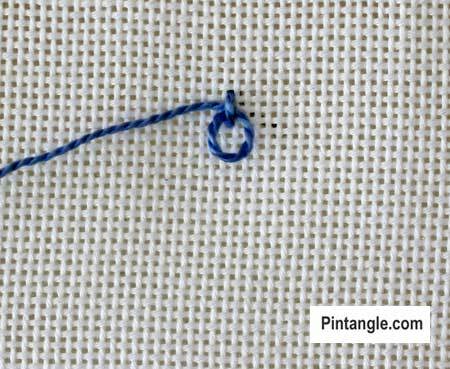 Bring your needle up again at the base of the diagonal stitch (see the illustration). From the top slide the needle under the diagonal stitch. When you pass the needle under the bar this movement will take your thread over the top of the bar. Move along the line make a second bar on to which you work your knot. In the illustrations I have used quite large foundation stitches so that people can see how the stitch is made. Space the knots evenly and close together to produce a textured line.The knots can be worked closely together to produce a heavy line or spaced quite far apart. Most of my samples are worked in perle #5 cotton but I often try it in thicker yarns (like knitting wool!) of perle #3 cotton. You can change the size of the arms to add textural interest and to create patterns or add beads. As I have already said Palestrina stitch is a textured stitch which holds a curve well. If you widen the stitch it becomes very interesting. For instance you can change the length of the arms. If you work the stitch on a curve and change the size of the arms it becomes very twiggy and organic which makes it ideal in floral sprays etc. The next sample is on the same cloth but every second stitch has extended arms in order to crate a pattern. 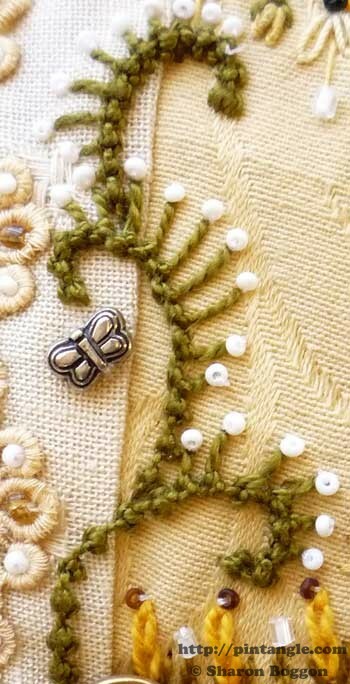 Palestrina Stitch It is a stitch found often on Italian embroidery – hence the name but it is also known as Double knot stitch, Tied coral stitch, Old English knot stitch, Smyrna stitch and it is also the stitch used in Twilling so it is called Twilling Stitch. If the bars are extended and well above the knot (as they are in the illustrations) this stitch becomes Long Armed Palestrina stitch and if the bars are long and below the knot it becomes Long Legged Palestrina stitch. Which ever version you use I hope you enjoy the Palestrina stitch. 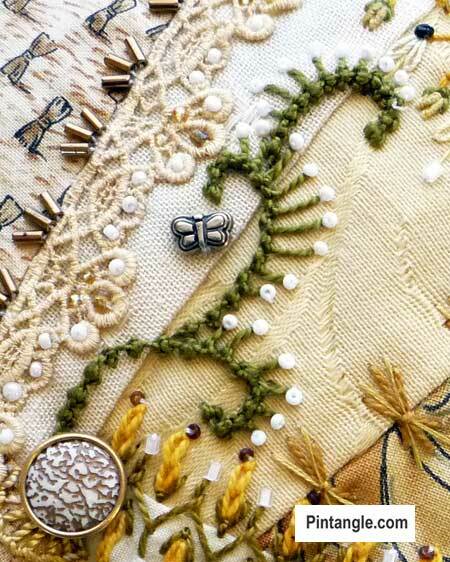 Lovely stitch and embroidery. 🙂 Embroidery is one of the things I wish to do if I have the time. I enjoyed working with this stitch! My journal now is so thick that I need to start another one. It’s a logical break, too, being on week 26…the midway point of the year. I stitched a mandala and also used this stitch on my CQ block in a few ways. my trials on palestrina is posting…. My try with palestrina stitch. She has problems posting a comment. Can you help? She might be going to the spam folder. I will keep an eye out for her. Because I’ll soon leave Ankara to Manila, time to stitch is missing. This weeks stitch is very interesting. I knew it by the name doubleknot stitch. But the tails upward and downward is new to me. I enjoyed doing the stitch. My trial can be viewed here. Here’s my first try at the Palestrina stitch. Hooray! the palestrina was a challenge, but I like it now! This is my first attempt at TAST. I just had to jump in. Finally got a blog post up for this week and last week’s stitches. I really like this weeks stitch! I will be experimenting more with it but for now another one of my scribbles. I worked my palestrina knots with cotton skeins. Hi Sharon, this stitch just blew me away !! I had never tried this one before, and it has opened up all sorts of creative ideas to me…….so thank you sharon……..
You can see my sample here…………………. This was a very interesting stitch. And a new one for me to learn. Here is my work for this week. I enjoyed to do this. What a fun stitch! I had a ball making this week’s project. again the stitch was new for me. Had much fun exploring several possibilities. Thanks, Sharon, for offering this wonderful possibility to learn! really loved this stitch once i got it figured out~! 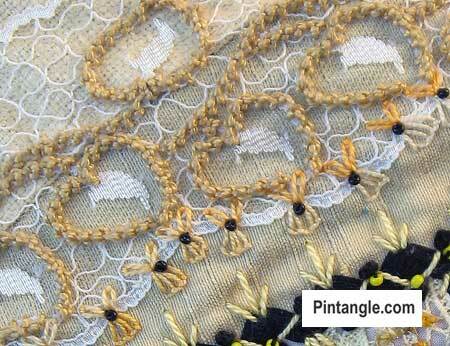 there is now a beautiful palestrina knot edging on some of the lace on wonderful daughter’s stocking. looks a bit like a braided trim. I like this stitch and my sample can be found on my blog. Thank you all. Happy Stitches! 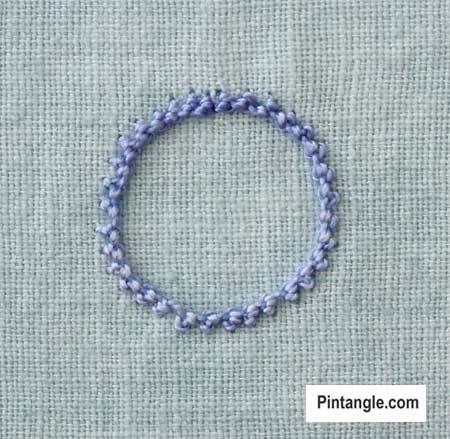 This is a really nice stitch to do. I really love your PinTangle website especially the Tuesday stitch. It is very inspiring. I am in the middle of a landscape quilt at the moment and when it is finished I am going to try the stitches. Loving crazy patchwork, I can’t wait. I wish there were 48 hours in the day! Just some catching up on older stitches. My sample work for the week 26 of TAST. For the second design I used wool yarn. trés joli point que j’affectionne moi aussi- il est super bien présenté dans ton post ! merci ! Your first sample is very pretty! http://christinaroland.blogspot.nl/2012/06/tast-week-26.html My contribution for this week. Completely new to me and a knot and….I like it :-). You may be able to convert me yet. You can see my latest addition to the mandala at: http://stitchinfingers.ning.com/profile/JessicaGrimm. I won’t be adding anything in the next two weeks as I will be teaching at the RSN. But I look forward to be able to add three stitches in one go afterwards! Here is the link for one of my old works using palistrina stitch. Have a look.